Enjoy new crashing and bashing performance fun with this Cars 3 Bumper Basher 1:55 Scale Vehicle 2-Pack Case! Recreate the humor and action of Derby style competition with this two-pack of 1:55 scale characters that includes a themed obstacle accessory! Just rev up the vehicles against a hard surface, release and see them speed off - then collide into obstacles and one another. Collect them all and recreate your favorite Cars races. 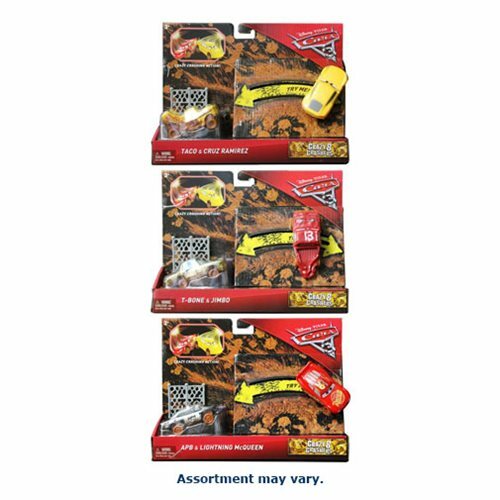 This Cars 3 Bumper Basher 1:55 Scale Vehicle 2-Pack Case contains 4 individually packaged 2-packs.